With the inaugural edition of ULTRA Brasil in Rio de Janeiro only a few months away, festival organizers are excited to finally unveil the complete Phase One lineup. 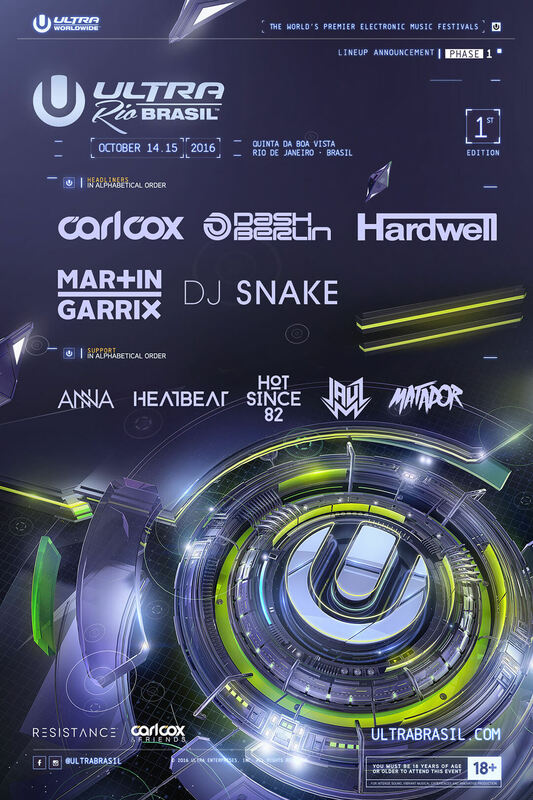 Having confirmed Carl Cox and Martin Garrix as the first ULTRA Brasil headliners live at Ultra Music Festival Miami earlier this year, the world’s most successful independent music festival brand has now selected three more of electronic music’s most sought-after acts to join the party in Rio on October 14 & 15, 2016. Next up will be French global megastar DJ Snake, whose collaboration with Major Lazer ‘Lean On’ has reached well over one billion views on YouTube, launching him to undisputed international stardom. Fan favorite Hardwell, who has been celebrated for his electrifying performances at countless ULTRA events worldwide is also confirmed to play at the highly-anticipated debut event, alongside fellow countryman Dash Berlin, who will be making the trip to Rio this October, much to the delight of thousands of trance loving Ultranauts. To balance out this finely curated list of headliners, ULTRA called up Argentinian trance and electro house duo Heatbeat and Bass House pioneer JAUZ for support. Last, but by no means least, ULTRA Brasil will be welcoming UK tech-house legend Hot Since 82 and Brazilian-born techno queen Anna and famed techno master, Matador, to the ‘Cidade Maravilhosa’, where the legendary DJs will showcase the freshest sounds from the deeper end of the spectrum on the RESISTANCE stage, artfully rounding out this spectacular Phase One billing. Due to an overwhelming demand for tickets, ULTRA Brasil recently announced that it will be moving to the beautiful, centrally located Quinta da Boa Vista Park. The idyllic sprawling landscape will serve as the perfect setting for the introduction of ULTRA Brasil and will effortlessly capture the essence of the brand’s storied productions. Tier 1 and Tier 2 tickets sold out shortly after becoming available earlier this year. Limited Tier 3 tickets are now on sale, however because demand for ULTRA Brasil has been so high, fans are advised to act quickly to avoid disappointment. In a historic year for ULTRA Worldwide, ULTRA Brasil will mark the final stop on its massive South American tour, crossing through Peru, Chile, Bolivia and Paraguay in just one week. For more information about ULTRA Brasil and all other ULTRA Worldwide events, stay tuned to www.ultrabrasil.com and www.umfworldwide.com.